You'd have to look pretty far and wide to top one of the Shelter Logic Portable Garage Canopies. 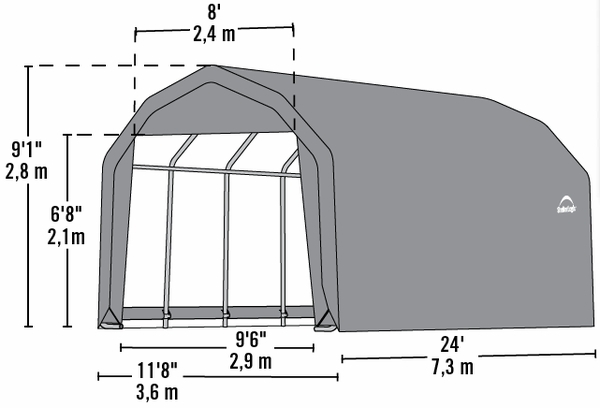 This Canopy measures 12 ft. x 24 ft, x 9 ft., and is part of their Barn-style line. 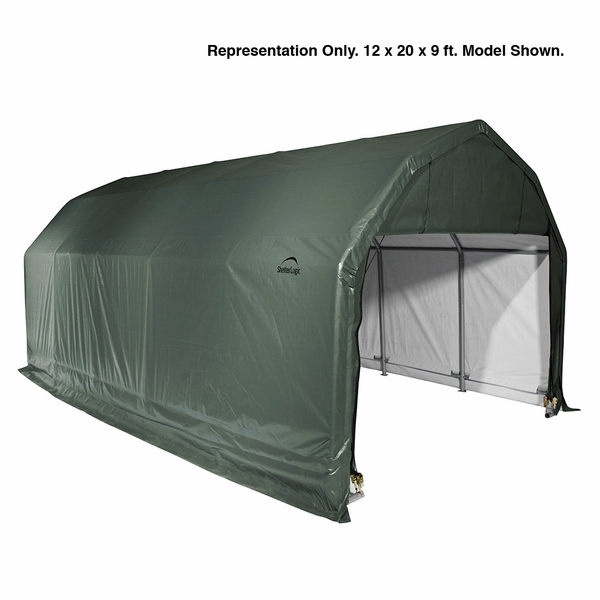 The canopy itself is made of a single piece of 90 oz., heat bonded, triple layered polyethylene that is treated to be anti-fungal and anti-aging, as well as being fade resistant. This sturdy portable garage is constructed of high-grade steel that goes through a 13 step Rhino Shield surface preparation process and can withstand all but the most rigorous weather conditions. This structure sets up quickly, usually requires no building permit, and comes with a 1 year warranty. The door is 6'6". Thank you for your inquiry. Is this garage snow rated? The manufacturer states that you must keep any accumulated snow brushed off the top with a soft bristled broom or mop. However, it would shed snow better than some other shaped sheds. The shed comes in 4 boxes with a total weight of 390 pounds. If you are interested in a unit that has snow load ratings, you may be interested in the ShelterTube shelters by ShelterLogic. These are available in both gray and green in sizes of 12 x 20 x 11, 12 x 25 x 11, and 12 x 30 x 11. They can resist winds up to 80 mph and snow/ground loads of 43 pounds per square foot (when used correctly). Is this garage canopy fully enclosed? Are there doors available on one end or both ends? This shelter comes with roll up doors on both sides. I realize you cannot make any warranties or promises because environmental conditions are highly variable and I am not looking for a warranty or a promise, but I'd like to know - Does this unit shed snow? It looks like it would preform pretty well. Also, what does it weigh? You are correct that we cannot offer any type of warranty against weather related conditions. The manufacturer states that you must keep any accumulated snow brushed off the top with a soft bristled broom or mop. However, it would shed snow better than some other shaped sheds. The shed comes in 4 boxes with a total weight of 390 pounds. If you are interested in a unit that has snow load ratings you may be interested in the ShelterTube shelters by ShelterLogic. These are available in both gray and green in sizes of 12 x 20 x 11, 12 x 25 x 11 and 12 x 30 x 11. They can resist winds up to 80 mph and snow/ground loads of 43 pounds per square foot (when used correctly). Does the ground have to be level for this item? The manufacturer suggests that the ground is level. If one side is higher than the other, or the front higher than the back, the structure might be compromised. What do you do with the extra flap on the ground on each side? After putting the garage up it is at least 15 or more inches on each side. Also the top does not seem tight enough, even after lowering the side pockets all the way to the ground on each side. What should I do? The flap of fabric that runs along each side of the tent is designed to simply lay flat on the ground. It is designed to channel water away from the edges of the tent in heavy rains. The tent top will have some looseness to allow for expansion and contraction when exposed to the sun. Please ensure the drawstrings are pulled as tight as they can go for best fit. Yes, ShelterLogic also makes a Grey Version of this unit. Excellent quality at a great price. Far greater than expected. Will be used to store my boat. Looks great! Pros* Price - Excellent alternative to expensive metal or wood structure and, because it is portable, without the addition of property tax. * Quality - I have owned a less expensive shelter and am pleased to see the materials used in this one are better suited to the winter climate. * As advertised - I wasn't expecting the vents but received 2 which were installed easily. * All parts were marked. Cons* Directions were sufficient but would benefit with additional details/pictures. I am an engineer and it took me 4 hours alone to assemble. * Received 2 extra tubes that were not needed. * Received 1 tube that had a different part number that wasn't called out but was exactly the same as the missing part number. The literature said the shelter could be put up in 2.5 to 3 hours with 3 people. It took 7.5 hours with 2 people. Most of the parts were in the boxes, we were short washers. The instructions were clear... Some parts were not marked, so we had to spend time comparing. Many of the welded parts were not welded in a perpendicular direction, so we had to work hard to get things to mate properly. Many of the welded parts were not round anymore, so I had to spend time making them round, again: so the pipes would mate. One half of a clamp was defective, but the company quickly shipped out a replacement. Eventually, it went together.